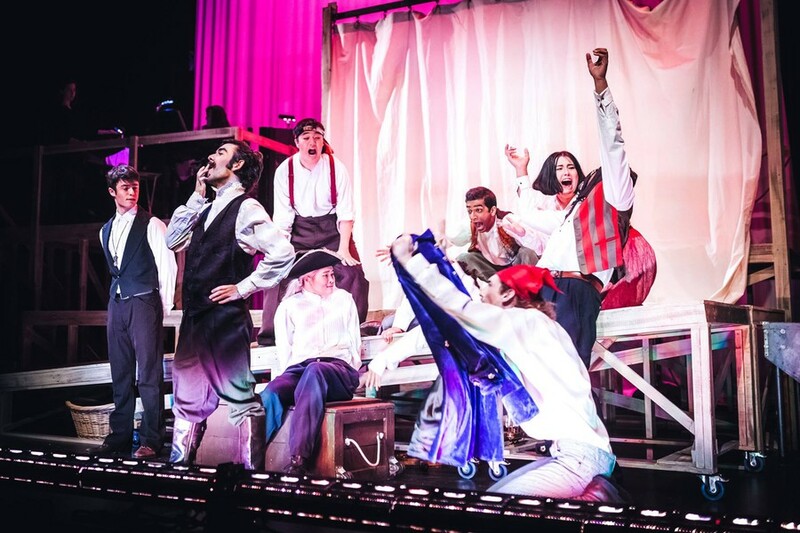 Last Thursday through Saturday evening, University Theater performed Rick Elice’s Peter and the Starcatcher to close out its fall season. Based on the novel by Dave Barry and Ridley Pearson, the UT/TAPS production was directed by fourth-year Tempest Wisdom and delighted viewers in a humorously swashbuckling backstory to the dearly beloved children’s tale of Peter Pan, featuring brilliant performances and equally stirring musical accompaniment. Taking place initially on two different vessels, the Wasp and the Neverland, the first act takes viewers from a ship hijacked by pirates to another ship carrying three orphans to be fed to snakes. One of the orphans is the anguished preteen that will become Peter Pan, played by first-year Krishna Kumar. Coincidentally, the eponymous starcatcher, Molly Aster, played by second-year Hope Gundlah, is also aboard this ship and, in somewhat of a cliché, the early sparks of a young love are ignited between the two characters. However, Starcatcher shines when it confronts such typical tropes: The characters seem self-aware of their existence within a larger narrative, often speaking in the third-person as narrators, breaking the fourth wall, or even outright conceding their fictional nature. Considering the myriad settings featured in the play, ranging from dark cabins deep in the bowels of Neverland to the depths of a magical pond, one would expect its production to either be impressively extravagant in simulating these places or bare and lacking in convincing set design elements. Peter and the Starcatcher does neither, resorting instead to simplistic, creative, and sometimes abstract props to invoke tight spaces and colossal beasts alike. Need a flying cat onstage? Just have one of the actors flail a stuffed animal around while meowing. You would think many of the tricks employed would be too amateur for university theater, but the improvised, makeshift appearance of these stage elements only calls more attention to the personal drama they were supposed to provide a platform for. The actors onstage know this, and that makes it even funnier. Like Tinkerbell, all the production needs for it to come alive is for the audience to believe. Second-year Leonardo Ferreira Guilhoto played a particularly animated role as Black Stache, the suavely self-assured pirate in desperate pursuit of a hero to counter his villainy (humorously, Black Stache says Peter could be his hero, his “boo”). His speech littered with puns and innuendos, Guilhoto commanded the stage anytime he spoke, ironically brandishing his Italian accent and soon-to-be-lost hand. Supposedly the villain, Black Stache’s “malicious” intentions are so shrouded beneath a film of comedy that it is hard to take the pirate too seriously. Where Black Stache lacks malevolence, Slank (first-year Kendall Phillips) makes up for it. Slank, a pirate and child-hater, is the true antagonist to Peter, planning to feed him to snakes. However, the highlight of Phillips’s performance, the consummation of Slank’s fate, revealed the character to be not far from what Peter could have become had he even grown up. All in all, UT did an excellent job of producing Elice’s play and had the audience laughing throughout the whole show. With touching and side-splitting performances on a stage stripped bare of all pretension, UT’s fourth show of the quarter was truly worth watching, even during reading period week. This article previously stated that "Peter and the Starcatcher" was the second show of UT's season; it was actually the fourth.